A professional job from start to finish. The empty house was transformed into a most attractive environment by the staging and the price we obtained for the house was above our expectations. I believe the staging provided by DMI Homestagers definitely helped me sell my home. I have had great seamless service from start to finish. I would definitely recommend them to others. There is no doubt in our mind that we earned back the cost of staging many times over by achieving a higher sale price. Thanks again, DMI! You did a beautiful job. The transformation took my breath away. The property which you so beautifully staged for us sold last evening at auction for a staggering $2,000,000. There was fierce bidding for it. Everyone who came through loved the way you had furnished this apartment and I told them all who you were, and of course many, many people already know you. The family and I thought your efforts were simply sensational. We were all very thrilled. Thank you once again Dinah we really appreciated your wonderful talent! Thanks to Dinah and the team for your efforts, professionalism and timeliness. Great styling for the apartment, which contributed to a successful sale. DMI immediately understood what my requirements were. The staging was beautifully done and I was delighted with the results. Outstanding service – and the staging was done exceptionally. Consult, quote and staging itself was all done with the minimum effort from myself. the team was flexible and went above and beyond several times during the process! Thanks very much for your efforts! I thought it was fantastic! And the furniture was all such high quality. It was definitely a factor in the sale. The people who bought our house just loved it and want to copy it – they just kept talking about it. I could never have done this myself. I loved the experience – it was great. Everyone was so professional and I was really happy with everything from start to finish. DMI have staged several homes for us now, and always do an amazing job – which definitely contributes to a quick and successful sale. We are always delighted when we see the finished product. We loved DMI's style – great taste. All the furniture and accessories were of a very high standard. DMI are an excellent team and we will hire them again. We highly recommend! The staging of my property was first class and this was of great assistance in the marketing of the property. Thanks – we achieved a fantastic result! Great service, and great communication from all the staff. By engaging the services of DMI my property achieved its maximum potential of selling quickly and above my expectation level. The property was staged appropriately for its target market and portrayed the home to the best of its ability. I would use DMI again when selling future properties. The house looks fabulous. We really appreciate your attention to detail. Thank you for great, stress free job. Very well thought out placement and choice of furniture and extras for the style of home we were marketing. I have used your company before and will definitely use you or recommend your service to others in the future. I definitely feel that your designer furniture and accessories played a significant role in the sale of our property. I selected DMI based on a referral and in checking your website could easily see that you provide a quality service. My husband in particular – who was not keen on staging … typical I guess as they don’t see the impact … well he was impressed beyond words, couldn’t believe how amazing you made our house look and feel. I wouldn’t sell another property without using your services. Of course we don’t all like to think that we have rubbish furnishings etc but the fact is decluttering and making the space really show the property off is essential in my view. We successfully sold our property last night. Much of the credit is due to the tasteful dressing done by your company. Many thanks for your help and your assistance. We are very happy. Our house looks just beautiful thank you so much. We thought your team was absolutely A+ - they all worked so hard to make it perfect and never stopped smiling once. Thank you for making it such a happy experience. Fantastic job, we had excellent feedback once the house staged. The furniture were all very tastful, and great staff representing DMI. We were very happy with how you achieved such an excellent look for our apartment and it would have most definitely helped the sale process. We thought the end result looked amazing - loved all the little touches. Beautifully done. Thank you for a very professional job. Thanks Dinah, great job and we think a good price as well! The sale of properties occurred in the first week. We believe the staging was instrumental in sale. Very positive comments about the staging and obviously far superior to other staging companies. Once again thank you for a superb job. Thank you for the excellent preparation and staging work done on my Tamaki Road property – the presentation looks terrific and really does show the property in an attractive light. The unit went to auction Wednesday morning and sold under the hammer for an excellent price. Great presentation was part of optimising the return on investment. We will be coming back to DMI in the next few months to have you stage a 4 bedroom property we have. I am recommending DMI to everyone! Going back to the property after the furniture had been removed I realised it was a great idea to stage it. Thanks again, we got the best price. I think the house staging paid for itself ten times over. Great job a small space thanks. Our home looked fantastic, even better in person than photos. It sold within one week (only Saturday/Sunday Open Home). We were so pleased that we went with DMI, from the outset we could tell that they were very professional and would do a superb job, they knew exactly what worked, the team worked so hard in completing the staging to a very tight deadline, all were extremely professional. Many thanks to Judy for such effort she put in to making our house look so beautiful (she went beyond what was expected). I would not hesitate to using DMI in the future. Thank you so much to all the team, an excellent job and well worth the cost. Very impressed with the staging. The choice of colours and furniture was excellent as was the attention to detail. No question it assisted greatly with a speedy sale and the resulting price. The DMI team did an outstanding job at dressing my house for sale. I definitely see the money I spent as an investment rather than a cost as I got a great sale price. You were outstanding. Portland Road was a hard sell, but you made it easy for me. Just fantastic. We only had the home staging for one week (sold) and everything was great from the point of setting it all up and taking it all away. We liked the look of the furniture, it just suited our decor. Fantastic job! 5 star service and 5 star designs! Definitely a "must do" for selling a house. It really shows the " personality" of the house. Thank you for all the designs and fast response. Each staff member we met were extremely efficient and professional. Warm and friendly - excellent all round. Very friendly and approachable staff. Were able to accommodate my needs even at VERY short notice. Matched the staging in the living room with drapes/colour perfectly - Loved it. Absolutely loved what Philly did to our house. The photos looked a million dollars. Because of the staging we were chosen to be on the cover of NZ Herald Sunday Homes and the cover of Bayleys Preview Magazine. Great exposure for us. I wanted to relay how beautifully you presented my clients home. Everyone who came through the property thought it absolutely beautiful. Because of the lovely photography we received a Herald editorial and the front cover of this month’s Bayleys Preview magazine. Thank you so much, I believe we achieved at least $30,000 plus more by using your services. Thanks again. We have always been delighted with the homestaging DMI have done for us over a number of properties and would only use DMI in the future. Thank you for the superb job. I know that your company staging the property gave us the very quick sale and great sale price that we were looking for. We would definitely use your services again and would highly recommend your service to anyone wishing to sell their home. Despite all my previous doubts about staging really being necessary, I think it really did make a difference. You did a great job of finding things to suit our property, and so I thank you again. Easy web site to navigate, good customer service by Dinah and Philly over phone. Quick professional service. House looked amazing and sold! Fabulous quality furniture. Thank you. Exceeded expectations and definitely attracted more buyers and delivered increased sale price. I sold the property at Taumata Road, Mt Albert. The furniture’s make the house looks more beautiful. I am very appreciate with your job. Thank you very much! Thanks – Another fantastic result thanks to your time and effort and skilful display fit out. Could not recommend DMI highly enough. Very professional and with the clients interests obviously the priority. Although the property did not sell, we do not think we would have received such positive feedback without the staging. Thank you. You have created a high standard of service and product which you continue to maintain very well. We were offering two units for sale. One of which was occupied and regarded as the more desirable of the two. The agents noticed that because of the high quality display of furniture the interest was on that apartment and it sold before the other occupied unit. Everything went like clockwork. All who attended the open homes remarked on the beautiful presentation of the home. Well done, DMI! When selling our Northcote Point property after having tried several times over a four year period to sell it with no success, we engaged with DMI Homestagers to fully stage our large 1925 bungalow. At the time of listing the market was flat and buyer orientated. However with the superb job DMI did of staging our home, we achieved $20k above our reserve at auction as a result of having several keen bidders who were all keen on the property. This result surprised our agent and other commentators in the market and I don't doubt that staging our home with DMI was a large part of our success. I thoroughly recommend DMI as the only home staging company to deal with. They are thorough, professional, organised and will help you achieve higher than expected results. Firstly I would like to say thank you very much for completing the installation at Ngake Street. It looks incredible! Absolutely fantastic, we all really love it, and the house has never looked better. Just a quick note to compliment the team you sent round to the apartment this morning and to thank you for everything you have done for us over the last couple of months. This morning’s team were meticulous and efficient – a credit to your company. A truly professional service, one which I will recommend highly to anyone. This is the second time we have used DMI. On both occasions we have achieved better than expected sale results. Highly recommended, thank you. Dinah did a FANTASTIC job. The house looked amazing and this definitely contributed to a much quicker sale (sold pre auction). Will use DMI again. We were very happy with the staged furniture and pleased we used DMI Homestagers. We have no doubt that the staged furniture added value to the sale price of our home. When you receive excellent service from the owner and all staff, it’s a pleasure to recommend the service! With 30 years in real estate I know just how much presentation means in the timing of the sale and to the actual price achieved. DMI Homestagers responded quickly, creating a welcoming atmosphere, presenting my property to best advantage with such appeal and style, it shortened the selling time and made viewing a pleasure. Buyers' comments were very positive and a speedy sale resulted even though it was in the holiday period. As a business owner I really appreciate such quality service from all involved, and I would definitely use DMI again and recommend them to all my friends. Thankyou for the wonderful homestaging recently set up in Kumeu. We really love it and appreciate how well you listened to our hopes and then gave us just the image we were looking for. It's such a pleasure to walk by the rooms and see it looking so nice. We were most impressed with your choice of furnishings and feel it made an impressive impact on the visual aesthetics and overall feel within the home. Many thanks from us both. I’d like to thank you and your team for your help and assistance in staging the house at Market Road, Epsom in the most professional, efficient and effective way. It is amazing to realize that the house looks “completely different” now – virtually “a new place” – after DMI Homestagers went through it. The quality and style of the furniture, the layout and the attention to detail all contribute to presenting the home with a clean and fresh image that will hopefully provide a very positive first impression on potential buyers. Your assistance has been very much appreciated. Thank you! 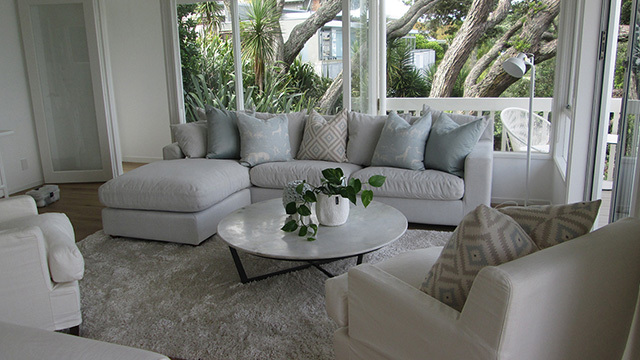 DMI Homestagers staged my Takapuna property and got it looking like a million dollars. I had 1000 hits on TradeMe over the weekend - I went live with the photos! Their staging and attention to detail is superb and I would recommend them unconditionally. We were struggling to sell our investment property at the beginning of the year. Dmi HomeStagers and interior Design were recommended to us not only for your expertise but also because we were advised that we could expect an offer closer to our asking price. I must admit I needed convincing and was a bit cynical, but I am writing to say how thrilled we are that we made that decision. I would like to thank you and your team for doing such a brilliant job, not only did you style the house so beautifully, but the team made sure the house was ready on each Show day and the domino effect was that we made more money on the sale and very quickly too – my only regret is that we didn’t do it earlier as the house was on the market for weeks. I have been telling everyone how great you all are and will definitely be recommending you. Totally professional performance by the whole team – from the receptionist right through to the lady at the top! Would recommend absolutely! I just wanted to say thank you! The house looks fantastic. And I really appreciate how quickly you got it done – you made a very stressful situation a lot easier for me. Every aspect of your product/service was excellent. I will recommend, Best Regards. Thank you – we were very happy you’re your service and consideration of our needs. Would recommend you to other gladly. Given that Ngaire Ave was an empty investment property, your quality homestaging enabled potential buyers to visualise the property’s full potential. We are sure that your professional service assisted us to achieve an excellent result. We highly recommend your service. DMI Homestagers’ furniture played a crucial part in the success of this 4-week marketing campaign and ultimately led to the successful auction this morning. The professionalism and the friendliness provided by DMI Homestagers’ entire team has been wonderful and it has been a pleasure dealing with your company. Your assistance, support, recommendations, advice and help in this entire process of staging and selling our property has been very much appreciated. Thank you very much! We have used DMI twice now and twice we have been very happy with the outcome and we will recommend you to others as well. Plus if we ever sell again we’ll definitely ring you again. Thanks a mill. Property staging no. 13 is coming up soon, and that says a lot about your service and results. You can say I’m a very satisfied customer! This is to acknowledge and appreciate the huge artistic talent brought to my home through DMI Homestagers. Congratulations team! Great Result. Look forward to having Dinah consult for us at our home in Te Atatu Peninsula. Thanks again. Sign up for our newsletter to receive design tips and DMI exclusive offers! Request a FREE no-obligation quote for our luxury home staging. Make sure to include as much detail as possible eg. number of rooms, bathrooms, etc.